While musical and artistic activities were encouraged at home, pursuing Art as an occupation was discouraged. I left France for Ireland at 19 in 1988 and went on to create a stained glass company into the year 2000. Throughout this period, I worked with vibrant colours and combined materials to achieve textures and convey a myriad of emotions into my craft. My main influence then was the representations of intricate designs from the Book of Kells and the Book of Durrow. I then joined the IT industry for 7 years, not wanting to miss the striving Digital age and worked as an IT trainer for various organizations. Having gone full circle, it is in 2009 that I reconnected with my creative side. Today, Inspired by Orthodox art combined with a reverence for metamorphosis, I like working with multi media when creating iconographical imagery. Without discounting the past by using some of the original techniques of icon making, I like integrating digital manipulations of old black & white photographs, wood, egg shell, fabric, metal, glass and plastic into my work. Artists that have influenced my work the most are Vincent Van Gogh, Paul Gauguin, and Frida Kahlo for their celebration of bold colours and the simplicity with which form is captivated. What drives my creativity today? Creating arts and crafts lets me communicate with people in a non-hierarchical, non-assuming way and I strive to keep my message simple and pure. I aspire to encourage playfulness and lightness when transforming images and to convey elegance and beauty in each of my pieces. My goal as an artist is to continue extracting bounties of creative ideas from my mind (and yours!) and express my most inner thoughts in colours and forms that most people will connect to and enjoy. What is my message to you? I am in the fine art of combining Digital art with craft by creating unique wooden animal icons. All my animal icon designs are created in-house which means that you can get a completely tailored portrait of your favourite pet. I promise to give you something so unique that you will not find another art piece remotely like it anywhere and you will cherish your animal icon for years to come. 1993 Release of the Celtic Glassware collection in Powerscourt Shopping Centre leading to sales throughout Ireland and overseas in Europe, the USA and Canada. 1998 Glass works featured on The Late Late Show. 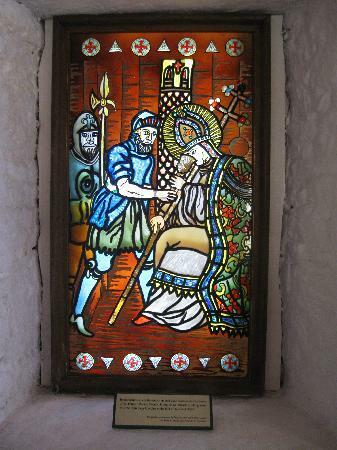 1998 Commissioned window for The International Museum of Wine at Desmond Castle, Kinsale, Co. Cork. 1999 Commissioned prizes for the Dublin City Council ST. Anne’s Park International Rose Trials Festival. 2008 3rd Prize in the ceramic category of the Dublin regional exhibition"Arts Against Stigma" featured in the Life & Culture section of The Irish Times describing my contribution as "[...] an accomplished ceramic piece, bright with dark undertones". 2009 Highly Commended Award for my collection of "Birds of Recession" - Dublin regional exhibition"Arts Against Stigma". 2012 Eight pages feature in White Lady's art book "Goblin Market: Irish New Contemporary Art"